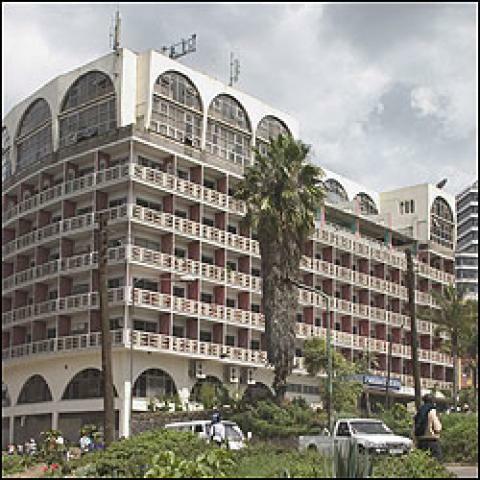 The Meridian Court Hotel is located within the city centre making it an ideal place for those travelling on business or in transit. It has 85 suites and two distinct restaurants serving international cuisine. It also includes a sports bar and a gym. For a hotel in Nairobi of its class, the room charges are a value for money. It is a favourite among travellers from africa and the Diaspora. 1 km from the railway station on the Muranga Road/Moi Avenue Junction. Using google maps:Go up Moi Avenue from the Haile Sellasie Round about and turn right at the Muranga Road Junction.